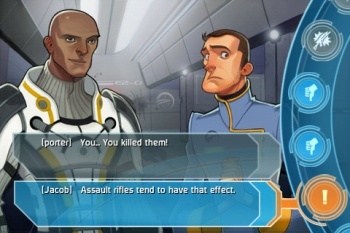 Don't worry: BioWare hated the Mass Effect iPhone game, too. Last summer, a number of gamers with iPhones bought Mass Effect: Galaxy to learn about the story between Mass Effect and Mass Effect 2. The game wasn't really that great, thanks to some awkward controls, and the players quickly lost interest in the title. It turns out that BioWare knows the game was flawed, and is now admitting to the misfire. According to Dr. Greg Zeschuk in an interview with Videogamer, "Oh, I think [the game] was very worth attempting. Even when something's not as successful as you'd like, you can take some lessons away and apply them, right? For us, that's kind of where humility comes in, to eat the humble pie on the Mass iPhone game [laughs] and go, 'Yeeeaaah, we made a big mistake,' in the sense that we thought story could carry it." Zeschuk backtracked about that last comment, stating that the game wasn't necessarily a mistake, although, "as much as we took a guess, our guess was wrong, and we learned something in the process ... unless your game is utterly designed about tactile gameplay, you shouldn't release it. That was good information for us to have." In spite of the game's less-than-stellar execution, BioWare is still considering the iPhone as a viable platform to use in the future. "We'll explore stuff," Zeschuk noted. "For us, it may be things that link into other games. It's the cross-platform nature of the potential platform, like an iPhone app able to somehow access one of the other games' universes, or something. That would be really cool."